A postwar spirit of experimentation and innovation infused and shaped the development of the California wine industry. Instead of returning to pre-Prohibition methods and varieties, grape growers and winemakers turned to science to find out what grapes to grow and where to plant them, in order to produce higher-quality table wines. The University of California at Davis was at the forefront of this viticulture and enological research. Scientists undertook climate studies to determine the best places to grow different types of grapes, and developed optimal designs for new vineyards, including spacing of plants and trellising systems. Other studies determined best vineyard practices, including crop irrigation, canopy management, fertilization, and pest control, and developed disease-resistant rootstock. Davis scientists urged the new winemakers to plant French varietals such as Cabernet Sauvignon, Merlot, Pinot Noir, and Chardonnay. In the 1940s, University of California scientists Maynard Amerine and A. J. Winkler studied the wine-producing regions of California. They recorded the “degree days,” the number of degrees above 50°F per day between April 1 and October 31, the growing season for most grapes. This research established the effects of climate and grape variety on the quality of wine and became the basis for recommending specific grape varieties for each region. This advice was put into practice in the 1960s, when new investors enabled growers to replant. The methodology was adapted by growers in other parts of the country and around the world. Before there can be any wine, there must be suitable grapes. Before there can be suitable grapes, there must be a climate they will find congenial. California illustrates these statements. 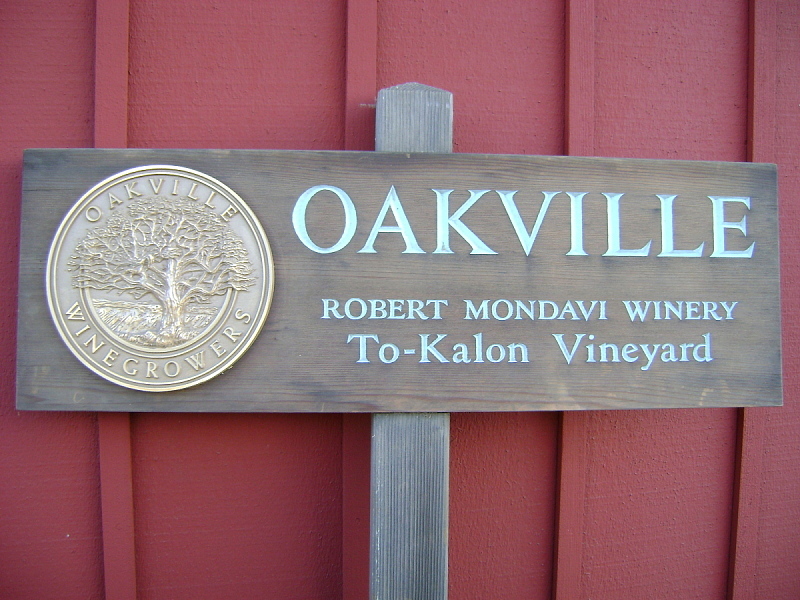 Mondavi purchased the To Kalon vineyard in Oakville in 1966. He recognized that the vineyard, first planted in the late 1860s, had all the elements required for the production of high-quality wines. Posted on Napa’s Route 29, this sign identifies the Oakville viticulture district. As an American Viticulture Area, it signifies that wines produced here reflect the distinctive character of the area. Gift of Robert Mondavi Winery. Harold P. Olmo developed disease-resistant rootstock and established the California vine-certification program for supplying strong, disease-free plants to the state’s growers. Olmo researched the genetic type (clone) of Chardonnay grown in California, which had low yield and little flavor. His work led to better clonal selection that vastly improved the quality of California Chardonnay. By the end of the 20th century, Chardonnay was the most widely planted white-wine grape in the state. Olmo, University of California viticulturist, had a tremendous impact on the rebirth of American wine. He spent decades developing some thirty new varieties of table and wine grapes. As the wine industry expanded in the 1960s, so did the need for labor to harvest the grapes. This was especially so in the large vineyards of the Central Valley, which has always produced the majority of the grapes used to make California wine. While the government-sponsored Bracero Program supplied labor in the form of Mexican guest workers until 1964, growers were already looking for ways to mechanize the harvest. The impact of harvesting machines on labor was significant; by the 1970s, most of the vast vineyards in the Central Valley were machine-harvested. California’s smaller estate wineries never adopted mechanical harvesters, but continued to hire crews to hand-harvest grapes. Harold Olmo and Henry E. Studer designed and patented this harvesting machine.